On 16 May 2012, Google unveiled the latest design for its search engine results pages (SERPs), inclusive of Knowledge Graph – a new feature which uses imagery and context to provide faster, fuller answers. More than this, however, it could represent a shift in the very purpose served by search results. Knowledge Graph is currently available in the US only, but a rollout to other nations is expected soon. Alongside the usual list of results, Knowledge Graph sits on the right-hand side and presents detailed information that it perceives to embody the user's primary interest. For example, if someone searches for 'Queen Elizabeth II', they may be greeted by an image of HRH, biographical information and some notable trivia – and perhaps even a location map for Buckingham Palace . How dramatic is this change? 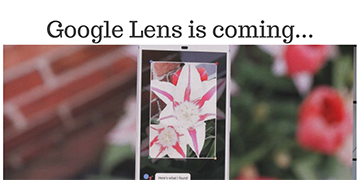 In recent years, Google has toyed with similar ideas. For example: If you search for the weather, or currency exchange rates, the actual information is shown at the top of search results – rather than simply a list of pages which may provide the details needed. Google also highlights particular results found in the realm of images, news and maps. The new feature goes one step further by enabling users to discover information about a subject from a quick glance, instead of having to click through to websites. What about the visual implications? 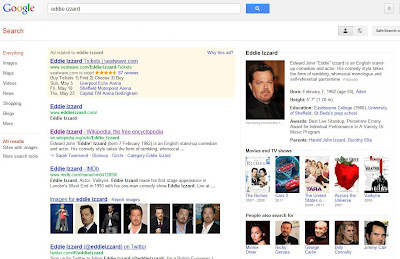 Knowledge Graph also makes Google's SERPs more visually dynamic. This makes a great deal of sense, from a design perspective, as best practice for website presentation has always focused on content grouped by headings, bullets, boxes and similar features which break up the text. However, Google's chief appeal has perhaps always been its simple approach to design and display. In this respect, users may find that the Knowledge Graph creates a cluttered experience that is less pleasing. It is also not clear how AdWords campaigns will be accommodated, as they usually occupy the right-hand side of Google SERPs. How does Wikipedia fit in? Much of the information displayed in the Knowledge Graph is likely to be drawn from Wikipedia. This is already a common reliance for Google, to some extent, which ranks Wikipedia highly and even suggests it as a source alongside news stories. However, is this good news for Wikipedia? If people are able to get facts directly from Google, they are less likely to need to click through to Wikipedia itself. There are also ongoing concerns about Wikipedia's accuracy. Much of its information is very useful and true, but most professional writers are always careful to cross-reference facts from other sources – and, as a self-governing entity, it is open to malicious attacks and practical jokes. Had Knowledge Graph existed in March 2012, people searching for information about Ashley Purdy of US rock band Black Veil Brides would have been instantly (and wrongly) informed that he was dead, thanks to a naughty Wikipedia editor. Doesn't it oversimplify the search for information? Some might argue that the whole point of search results is to provide information that isn't already easily available from certain resources. For example: If someone is seeking basic facts about a famous person or place, they are likely to go straight to Wikipedia and bypass Google entirely. Similarly, if someone wants to know about the cast of a film, they are likely to go straight to the Internet Movie Database. For many, it is such an intuitive, habitual practice that they don't even realise there's an extra click or some extra typing involved. 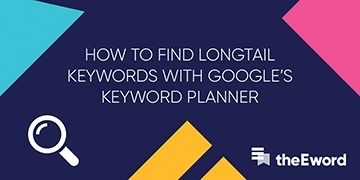 For more obscure angles on subjects, however, Google searches are invaluable – and yet the Knowledge Graph will focus on the most obvious information related to certain keywords. This almost has the flavour of an overly-helpful, 'nannying' approach to web use; usually the territory of companies such as AOL and Microsoft. For seasoned users, it could be more irritating than useful – but will undoubtedly be handy for those less well-acquainted with the online world's other star features.